Banoffee Cupcakes are a chocolate cupcake filled with bananas and creamy caramel and topped with whipped cream! 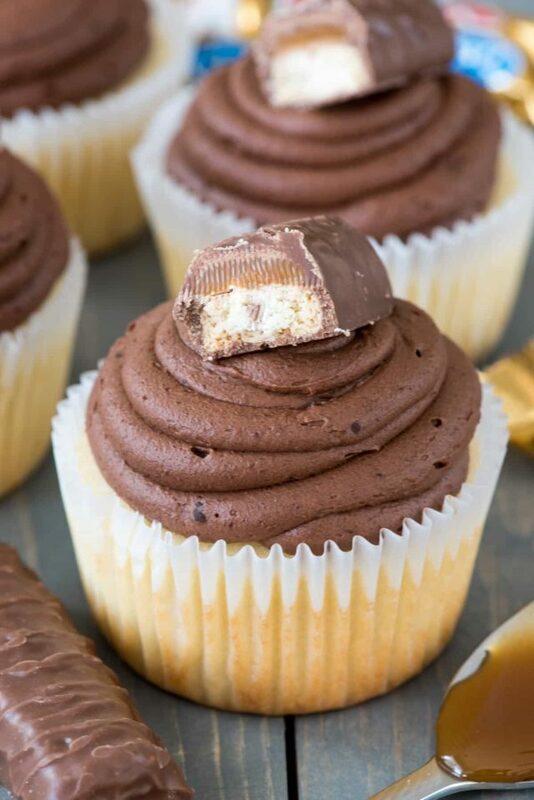 This easy cupcake recipe is a twist on a popular English dessert. Why is spring so hard? I feel like the school year just kind of slides through the fall with the promise of the holidays, then we return and winter lasts forever and suddenly it’s spring and ALL THE THINGS HAPPEN. Dance tryouts, sports (if your kids does them), school registration, tests, spring fever…and the list goes on, piling its way to summer. Why is that? Maybe it’s because our spring break is late this year (it’s always tied to Easter, which is late) but I feel like the end of the school year is just around the corner and it’s like a freight train I can’t get off. All those resolutions and January intentions that we put off “until spring” are finally here…and we’ll blink and it will be summer, school will be out and MY DAUGHTER WILL BE A HIGH SCHOOLER. Maybe it makes me reflective because I started my blog when she was in Kindergarten. Her bookends of school are all a reminder that her in school started my journey as well. Speaking of blogging, I didn’t know what banoffee was until I became a blogger. This is kind of a trend, like how I didn’t know what fluff salad was, or that I liked lemon desserts, or that I’d never heard of chess pie. 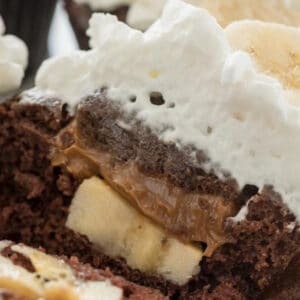 Banoffee Cupcakes are a twist on an English pie: they’re a chocolate cupcake full of caramel and banana capped off with a whipped cream topping. Banoffee pie is an English dessert that’s typically made from bananas, cream, and toffee in a graham cracker crust (rather, a digestive biscuit crust, since I don’t think they have graham crackers in the UK.) Some recipe for Banoffee Pie include chocolate or coffee as well. The word banoffee comes from the combination of banana and toffee. Get it? Banoffee! The original dessert mash-up. 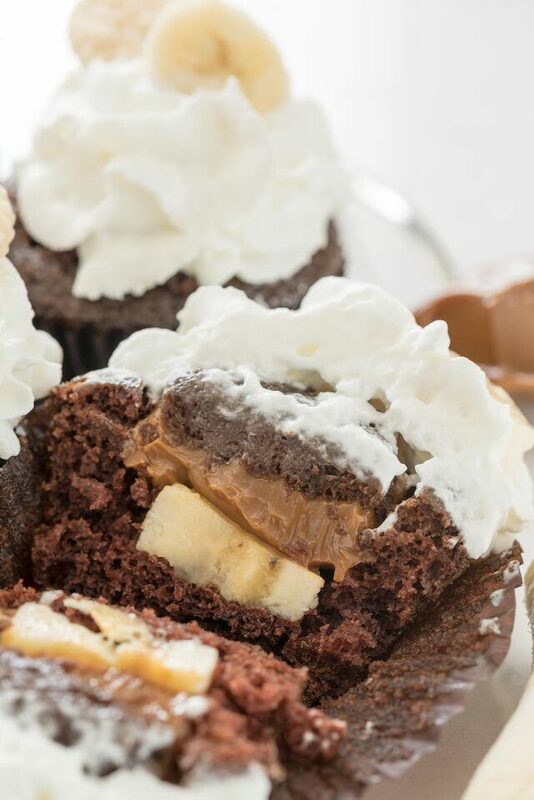 Now, you might be thinking that toffee does not look like what’s in the center of these cupcakes, and you’d be right. Normal toffee, as we’re used to it, is a crunchy delicious candy dessert (it’s especially good with peanut butter). In fact, the person who invented the Banoffee Pie called it toffee, but what he did was boil an unopened can of sweetened condensed milk until it be came caramelized. So, not quite caramel, but close. Anyone who is still reading might have already had their Oprah Aha! Moment, but if you did don’t spoil it for the others. K, guys, let’s make the connection: what happens when you boil a can of sweetened condensed milk? That’s right: you get dulce de leche! Dulce de Leche is just cooked sweetened condensed milk. You can boil it or you can make dulce de leche in the slow cooker. It’s a delicious and thick caramel-like substance: it’s thicker than caramel and has a sweeter flavor with also having that reminiscent burned-in-a-good-way sugar taste. 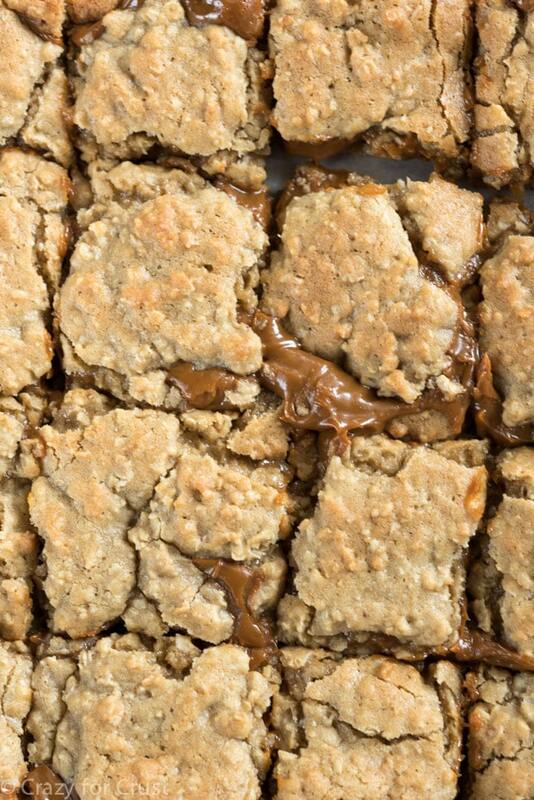 Dulce de Leche is great in revel bars, ice cream, gooey bars, pie, and it’s even great as a coffee creamer. It’s also great on a spoon but probably not entirely acceptable. So if you want to make your own Banoffee pie or Banoffee cupcakes, you just need a can of dulce de leche! Instead of going the pie route, I decided to make these into Banoffee Cupcakes. It’s really the easiest recipe because cupcakes are SO easy to make. Banoffee cupcakes start with my homemade chocolate cupcakes, but you can also make some from a box. 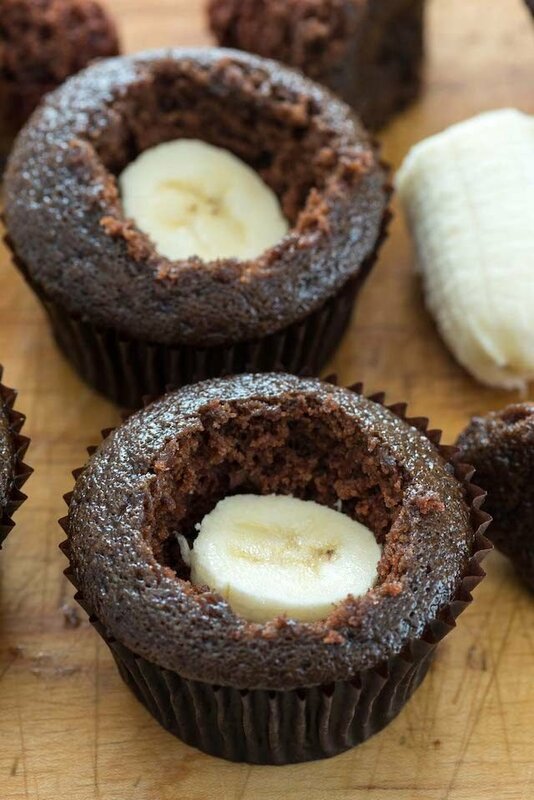 Simply hollow out part of the center of the cupcake and place a slice or two of banana inside. 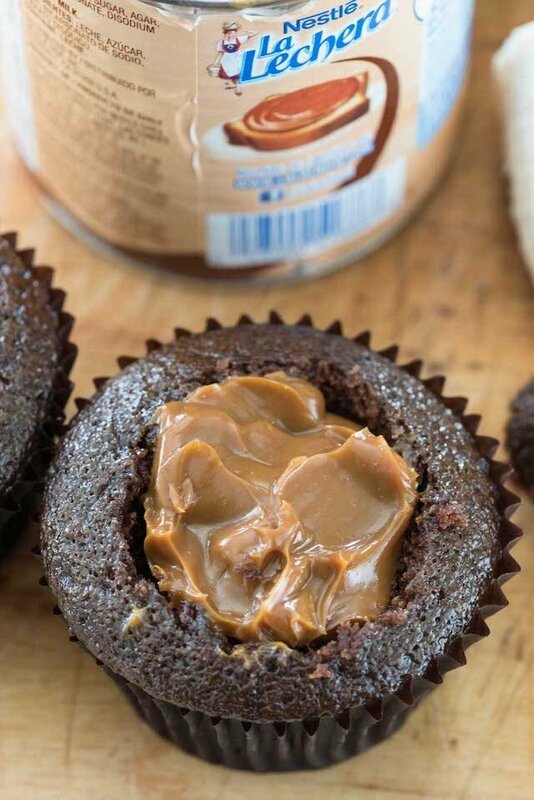 Then fill the cupcake with a spoonful of dulce de leche and replace part of the piece you cut out of the cupcake to cover it. Simply frost and decorate and you’re ready to go! What kind of frosting goes on banoffee cupcakes? Because Banoffee Pie is topped with whipped cream, I went that route for topping my cupcakes. 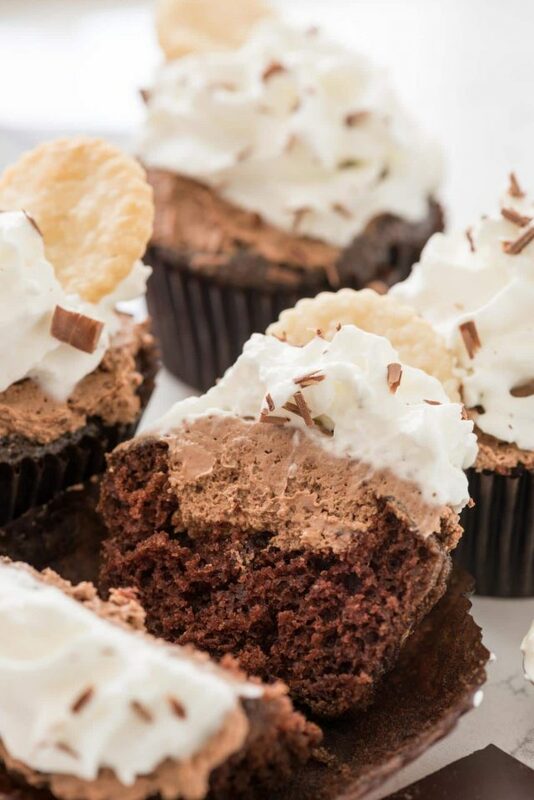 TIP: if you’re serving your cupcakes later, wait to frost them with the whipped cream so it doesn’t collapse. If you’re looking to use a more stable frosting, use cream cheese whipped cream or cool whip to top the cupcakes. 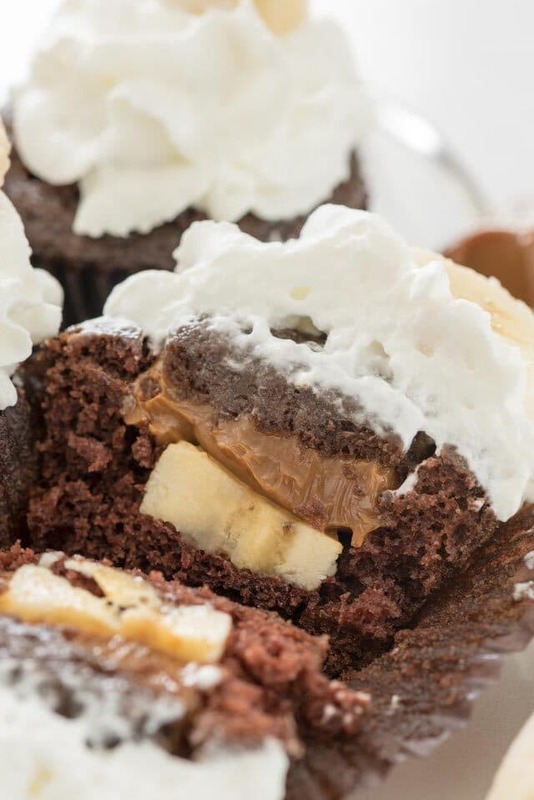 The combination of banana and caramel and chocolate cupcake is pure heaven. This is a great fun cupcake recipe for any occasion! You can use my homemade chocolate cupcake recipe or a box mix. Or, ask the bakery department of your grocery store if you can have 2 dozen unfrosted cupcakes. They sell dulce de leche in cans near the sweetened condensed milk in the baking aisle if you don’t want to make your own. If using whipped cream, frost right before serving. Want a fun garnish? Top with banana slices and pie crust dippers. 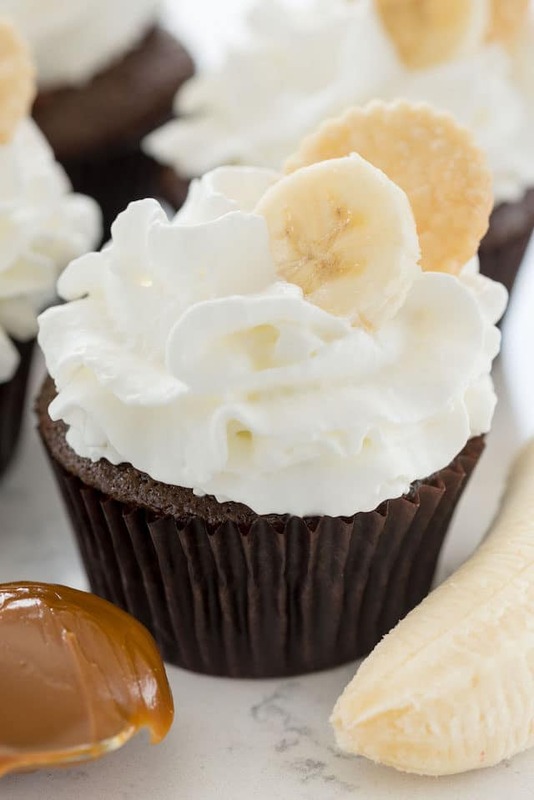 These easy chocolate cupcakes are actually BANOFFEE Cupcakes filled with dulce de leche and banana! Use your favorite flavor cupcake. This is my favorite Chocolate Cupcake and this is my favorite Vanilla Cupcake. If you are making from scratch, just omit the frosting and fillings from the recipe. You can also use a box mix. Cut a cone shape out of the center of each cupcake. Place one slice of banana in the bottom of each cavity, then fill the rest with some dulce de leche. Cut the points off the cupcake cones you removed and replace the flat top. Frost with whipped cream or Cool Whip (just before serving or it’ll deflate) and top with another banana slice and/or a pie crust dipper. Feel free to use cupcakes baked and cooled from a box mix or from the grocery. If you prefer a stable frosting, use the cream cheese whipped cream from this post.